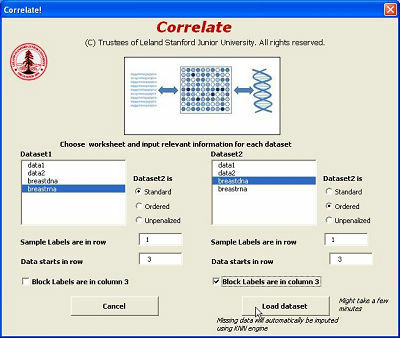 Correlate is an Excel plug-in that performs sparse canonical correlation analysis. If two sets of assays (e.g. gene expression and DNA copy number) have been performed on the same set of patient samples then sparse CCA can be used to find a set of variables in assay 1 that is maximally correlated with a set of variables in assay 2. Correlate is a very flexible tool for correlating any pair of data sets with measurements taken on the same set of samples. For instance you can use it to correlate a set of clinical variables with a set of genomic measurements.